About 14 species, mostly natives of America. Only the following are known in North America. Type species: Alisma rostratum Nutt. Scapes reclining or prostrate: style shorter than the ovary; beak of achene short. Scapes erect; style longer than the ovary; beak of achene long. Sagittaria radicans Nutt. Trans. Am. Phil. Soc. (II.) 5: 159. 1833-37. Echinodorus radicans Engelm. in A. Gray, Man. Leaves coarse, ovate, obtuse, cordate, 2'-8' long, 1 1/2'-7 1/2 wide, marked with short pellucid lines, nerves 5-9; cross-veins netted. Petioles sometimes 20' long; scapes creeping, 2°-4° long, scabrous, often rooting at the nodes; verticils distant; bracts linear-lanceolate, acuminate, dilated at the base; pedicels 3-12, unequal, l'-2 1/2' long, slender; sepals persistent, shorter than the heads; petals larger, obovate, about 3" long; stamens about 20; style shorter than the ovary; achenes numerous, about 2" long, 6-10-ribbed, with 2-several oval glands on each side and beaks about one-fourth their length; fruiting heads 4" in diameter. In swamps, Illinois to North Carolina and Florida, west to Missouri and Texas. June-July. 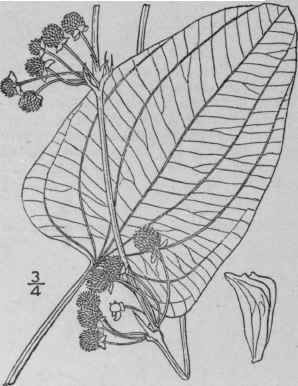 Alisma cordifolia L. Sp. PI. 343. 1753. Echinodorus rostratus Engelm. in A. Gray, Man. Ed. 2, 538. 1856. Echinodorus cordifolius Griseb. Abh. Kon. Bush; Fl. Jackson Co. 10. 1902. 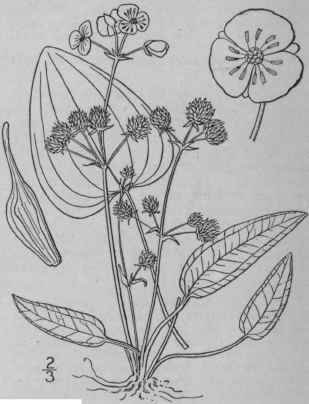 Leaves various, ovate, obtuse, cordate, 6'- 8' long and wide, in smaller plants sometimes lanceolate, acute at each end, 1'-2' long; petioles angular, striate, i'-io' high; scapes 1 or more, erect, 5'-16' tall; flowers 3-6 in the verticils; pedicels \'-\' long, erect after flowering; bracts linear-lanceolate, acuminate, dilated at the base; sepals shorter than the heads; petals 2"-3" long; stamens often 12; styles longer than the ovary; fruiting heads bur-like, 2"-3" in diameter; achenes 1 1/2" long, narrowly obovate or falcate, 6-8-ribbed; beak apical, half the length of the achene. In swamps and ditches, Illinois to Florida, west to Missouri and Texas. Also in tropical America. June-July.